I had replaced the microwave oven that came with the house 15-18 years ago, and late last year the replacement failed. It was the over-the-range type and had installed fairly easily, but we discovered over the years that the microwave was too close to the range top, making it difficult to stir tall pots sitting on the back burners. This view shows an 18 quart pot and lid on the big back burner under the old microwave. It is not a pot we use very frequently, but even stirring pasta in an eight quart pot on the same burner proved somewhat problematic. To make matters worse, the replacement microwave oven we wanted was even taller and wouldn’t fit in the space between the shelf and the top of the tiles of the backsplash. The solution was to install the new microwave higher, which involved tearing into the shelf above the range and installing a new shelf. Over-the-range microwave ovens are supported by a bracket mounted on the wall behind it, but much of the oven’s weight is borne by bolts through the shelf above the microwave. It isn’t clear in the pictures, but the old shelf shown here is supported very well in rabbet joints or slots in the vertical part of the cabinets on either side of it. The solid wood trim piece (not shown) adds rigidity to the plywood shelf, helping to minimize sagging of the shelf when the microwave is bolted to it. I used an electric jig saw to cut through the shelf and tore it out in two pieces. From a piece of oak plywood purchased at a home center store, I cut out a shelf using a circular saw such that it would fit snugly in the space between the two cabinets. The plan was to mount the new shelf 4.0 inches higher than the original shelf. Cutting the shelf piece involved careful measuring, marking, and sawing. Having a good quality circular saw really helped. I used the template that came with the new microwave oven to modify the shelf before installing it. I stained and finished the wood with leftover supplies from when we had the kitchen cabinets refinished. The holes in the shelf didn’t seem to quite line up with the holes in the new oven, so I filed one of them into a slot or slightly elongated hole. I used a rat-tail file to do this. Prior to tearing out the original shelf, I used a scribe to mark a line 4.0 inches above the old shelf. I extended this along the thin plywood back of the cabinet and cut out the excess part of the back of the cabinet with a sharp knife. I slid the new shelf in and aligned it with the line I had scratched with the scribe, and supported the shelf with temporary metal supports that were originally manufactured to hold screens into window frames. I also marked where the shelf would go with pencil and masking tape. In the photos you can make out where later I drew the center line of the shelf and marked about every inch where holes for supports would go. I drilled nine pilot holes from where the shelf would be into the cabinets on either side. This way when I would back-drill the pilot holes from inside the cabinets, they would be centered in the shelf even if I didn’t drill these pilot holes particularly level. Next I slid the shelf into place and lined it up as perfectly as I could. Then, I back-drilled four pilot holes into the shelf for nails that would hold the shelf in place for the next step: attaching it between the two cabinets. With the shelf pinned by nails, all that remained was to fasten it more permanently. I had thought I would used wood screws, but realized screws would act as wedges that could split the plywood shelf. Some experimentation with scrap material bore this out, and wood dowels seemed more like the way to go. I got some 5/16″ wood dowels and following advice I read on the internet, also employed a clamp to hold the plywood together the best that I could while drilling the shelf and installing the dowels. 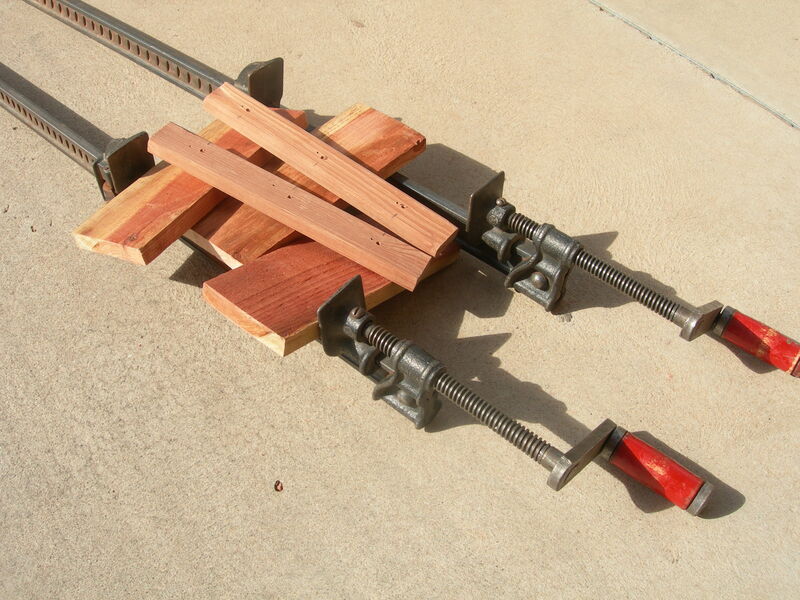 I didn’t have a proper wood clamp, so I did the best that I could. The dowels that were to support the most weight were installed where the clamp was most effective, close to the front of the shelf. 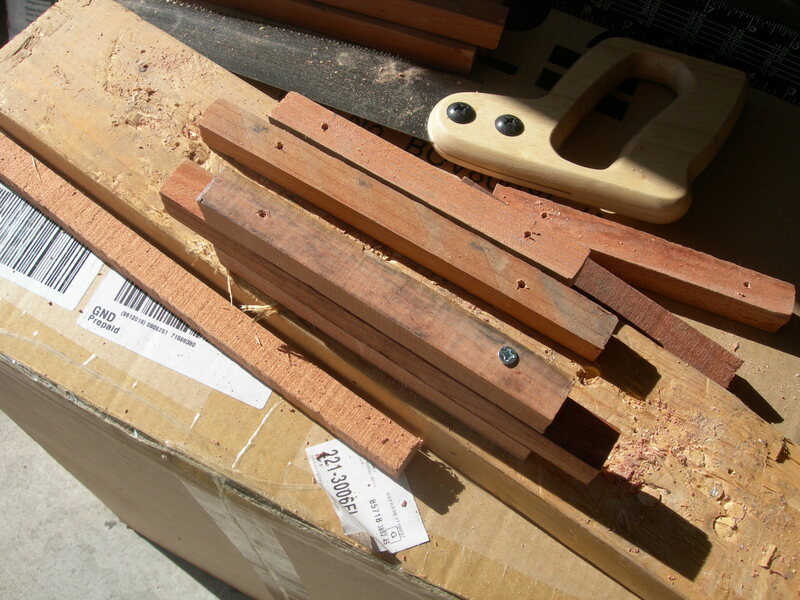 … and did the same thing for the 5/16″ drilling of holes for the dowels. Here is what it looked like before installing the dowels on the left hand side. I made a nozzle for my glue bottle using pieces from old caulking tubes. 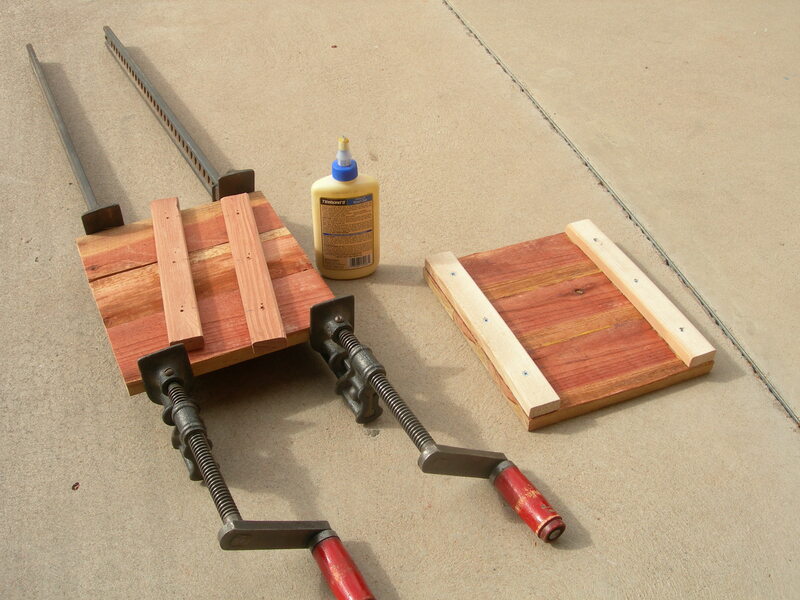 This helped greatly in loading up the drill holes with wood glue. After installing seven dowels on one side, I could pull out the two nails and install two more dowels. After removing the clamp, I found a bit of a glue mess, but that was easy to clean up. The dowels on the right hand side went in quickly and easily. I used a blend/fill pencil to cover up the imperfections. I followed the directions that came with the new microwave oven to install the wall bracket. I added a support under the shelf at the back, but didn’t figure that really helped much. You can see the trim piece that I glued and nailed to the front of the shelf. As mentioned earlier, this adds rigidity to minimize the shelf sagging under the weight of the microwave. With help, I installed the new oven. It was quite heavy, but went in easily. I had set up the microwave oven’s vent fan to exhaust up so that exhaust air could vent through a hood boot to the existing vent on the roof. The vent pipe was not centered, and the spacing was such that standard parts would not allow connecting the oven’s vent to the vent pipe. I designed a hood boot and a flat piece to finish off the hole through the top of the cabinet. The rectangular dimensions of the hood boot are per the instructions that came with the microwave, but I came up with the offset and height through careful measuring. Here are the designs of the flat ring and the microwave hood boot. A local custom sheet metal company fabricated the two parts. Fortunately the vent pipe would move up about an inch, making it possible to set the hood boot without too much trouble. I used metal tape to connect the boot to the stack, and screws to install the flat ring. Here is how it turned out. To finish the project, something has to be done about cabinet doors since the old ones are too tall now. Also something has to be done at the backsplash because now there is a gap between the tile and the bottom of the new microwave oven. (The bottom of the new microwave is a little over three inches higher than the old microwave.) We are still trying to decide what to do on these last two items, but in the meantime, we have a microwave oven that works, and a hood vent that works. The sugar water in a small glass hummingbird feeder disappears every night. Nothing is left in the morning except strange smudgy marks on the lid and sometimes a small green wasp-like fly or two, either stuck inside or scouring the film of sugar on the outside of the feeder. There is one in the image below. I set up a trail camera a few nights ago and got videos of one night’s visitors. The camera’s flash must have startled them, because they didn’t come back after midnight, and there was still sugar water in the morning. They were there all night. The last of the bat images was right before 5:00 a.m. When it started getting light, birds were checking it out. 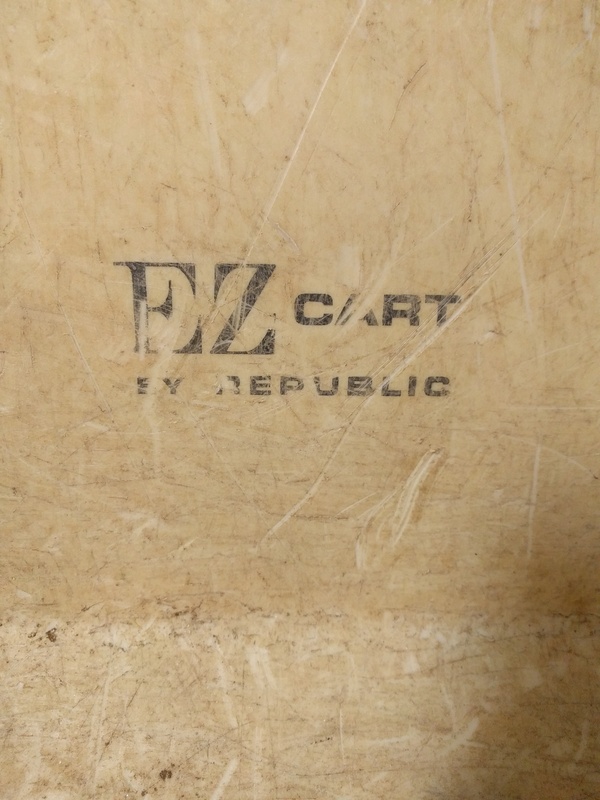 Eve asked about the cart shown in the post Dirt, Rocks, Stairs. It had been used a lot, and the project of making the stairs did it in. The plastic broke because of too much weight being put in the cart. 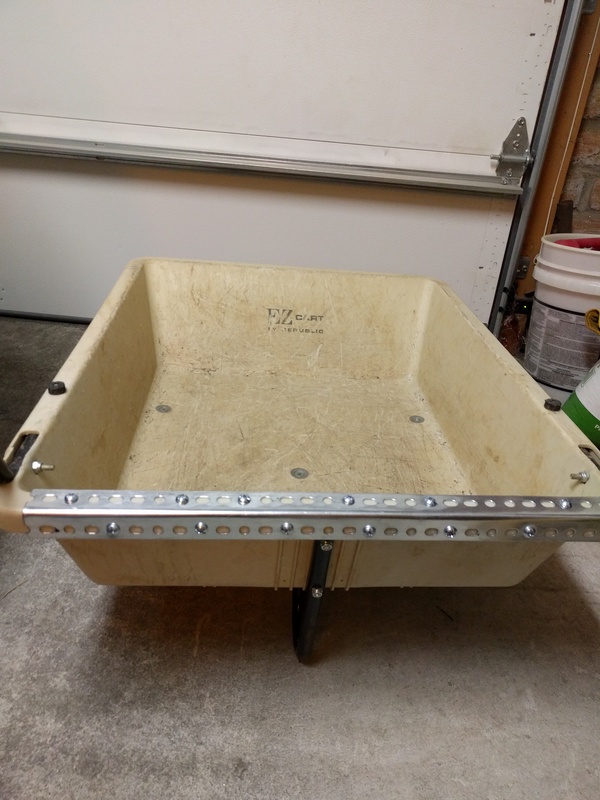 I had rigged it to work a time or two and it was fine for light loads, but I imagined I could fix it, and after getting the question, I got around to doing something about it. I bought some slotted angle, 1-1/4 inch, 18 gauge, zinc plated. It is not too heavy duty, but stronger than the plastic. I also got 1/2 inch machine screws, 1/4-20, matching nuts of the locking type with Nylon to lock them in place, and washers to go under the nuts so they wouldn’t break through the plastic when tightened down. The plastic was split right where the support attached. 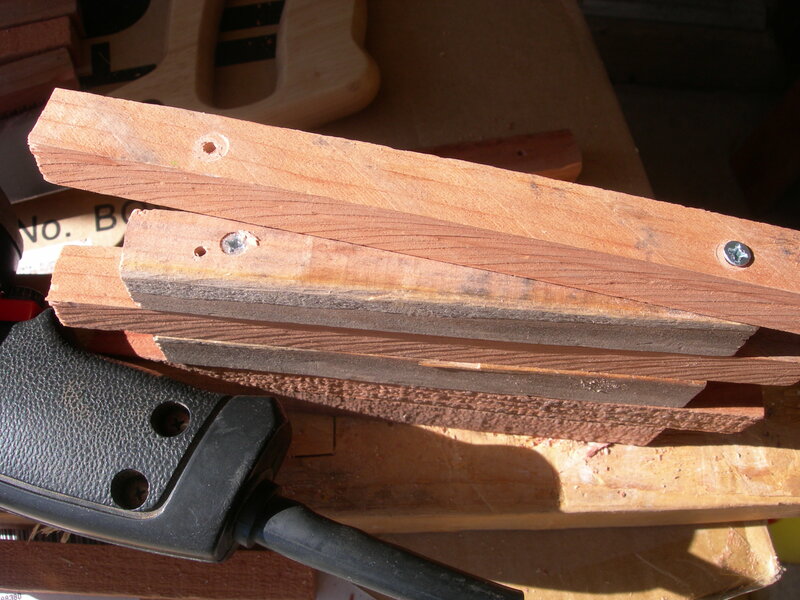 I attached the angle on the left side of the break first, drilling 3/8″ holes to match the holes in the angle. With the angle securely attached on the left, I used a long clamp to pull the split back together. Then I attached the angle on the right side as before. We have a bird feeder that has been deteriorating over the years, and the ongoing process of patching it up has been a running gag around here. 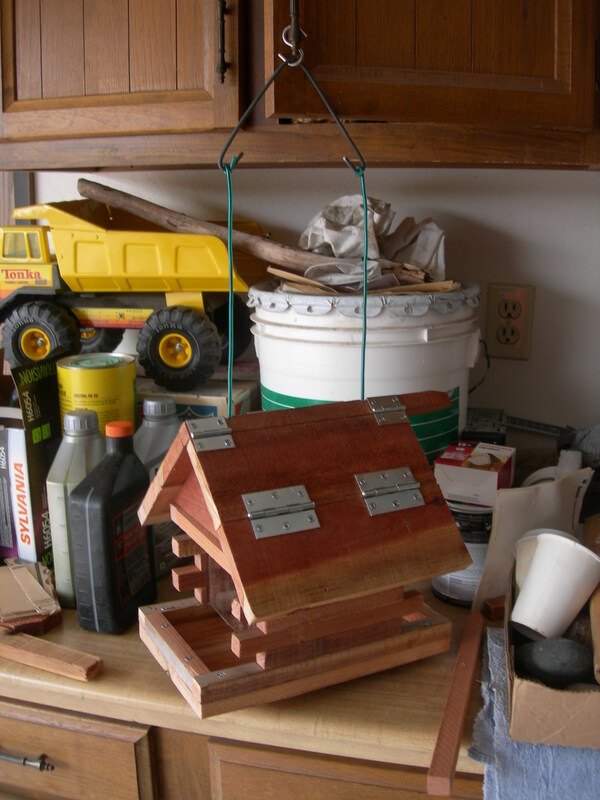 The feeder is shaped like a little house, reminiscent of a log cabin with two porches and a pitched, gabled roof. The string that held it up broke first, then as the wood dried out, the long, wire staples connecting the pieces of this little house together started slipping out. I replaced the string with plastic-sheathed wire, and put screws or nails in as the staples failed. One of the two boards that comprise the roof had split in two places, and now these separate pieces of wood are linked together with bits of flattened out metal found objects and tiny screws, looking sort of like hinges, but barely holding things together. 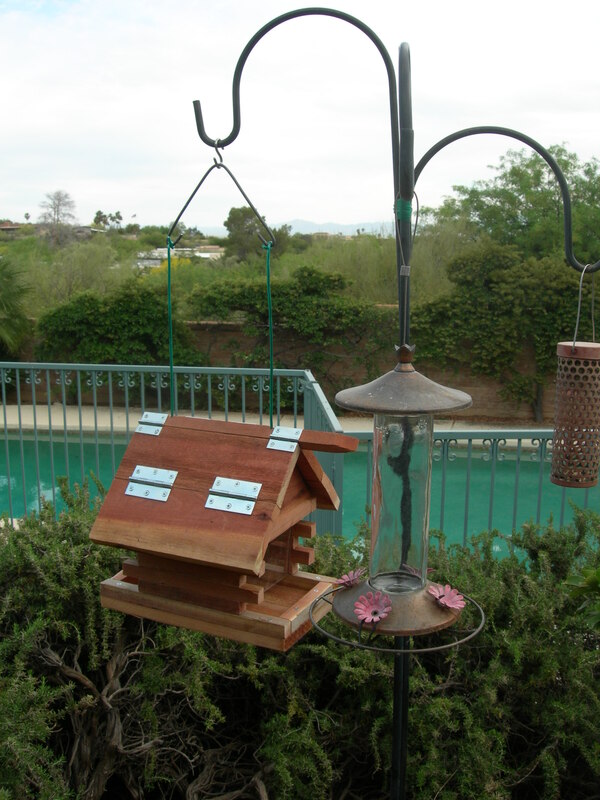 I decided to build a new bird feeder modeled after the old one, using redwood fence wood and 3/4 inch garden stakes. 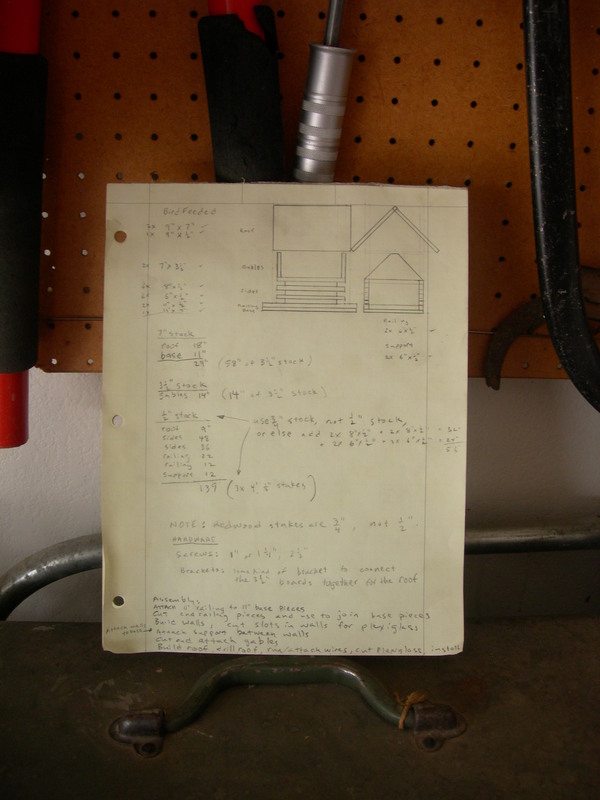 When I started drawing up this plan, I was mistakenly thinking the wood was a 1/2 inch thick, but it is more like 3/4 inch, so the drawing is not exactly to scale. The side walls will be made out of varying lengths of 3/4 inch garden stake wood, and the end walls under the gables will be clear Plexiglass. 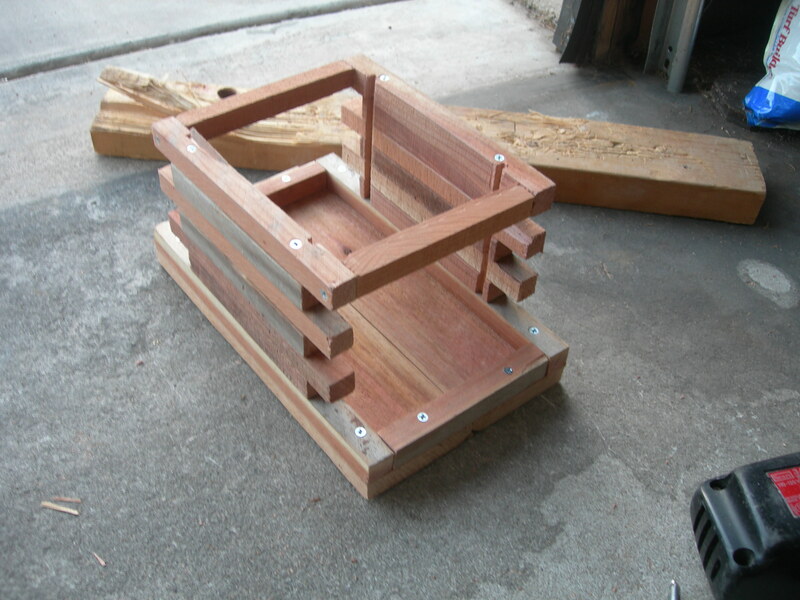 I started by making the base, which has railings to keep the seed in. The fence wood is 3-1/2″ wide, so the seven-inch wide base is two pieces of fence wood tied together by the railings. 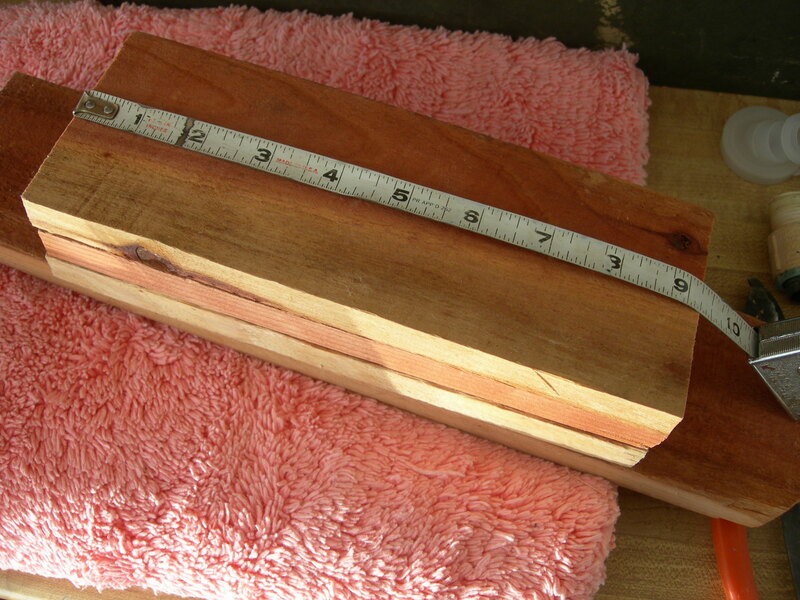 The length of the base is 11 inches. I used 1-1/4 inch screws on the railings to keep the screws from going all the way through the wood. I had to adjust the length of the end pieces, so I sanded them a little to fit. 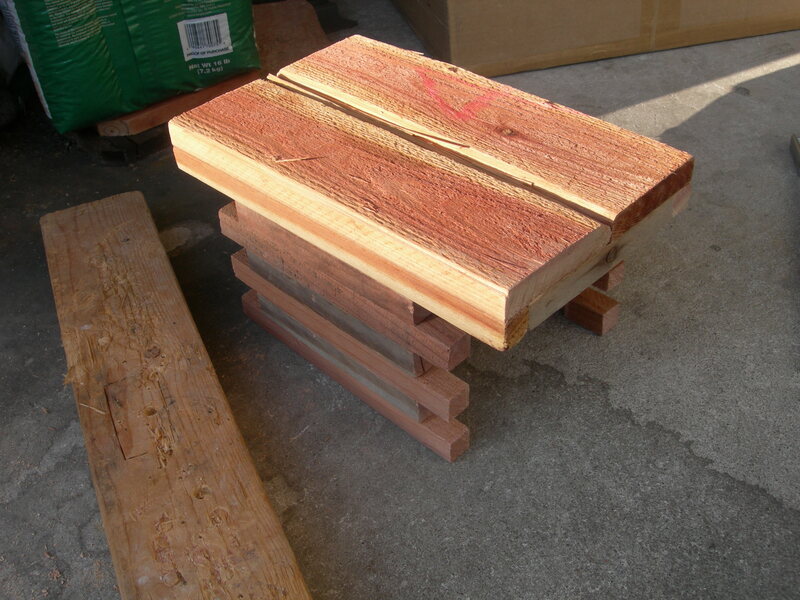 After making the base, I built the “log” walls out of six inch and eight inch pieces of redwood stakes. I pre-drilled the clearance holes, staggering them, and leaving room for slots where the Plexiglass would go. I used 1-1/2 inch screws, which are a bit longer than the thickness of two pieces of wood, the 3/4″ wood actually being more like 11/16″ thick. I ran the risk of the screws going all the way through two boards and hitting the screw head two layers down, but somehow it didn’t seem to matter, probably because I don’t drill very straight. As usual, I would drill one pilot hole and attach the first screw before drilling a second pilot hole for the second screw. After the walls were built, it was time to cut the slots for the Plexiglass. 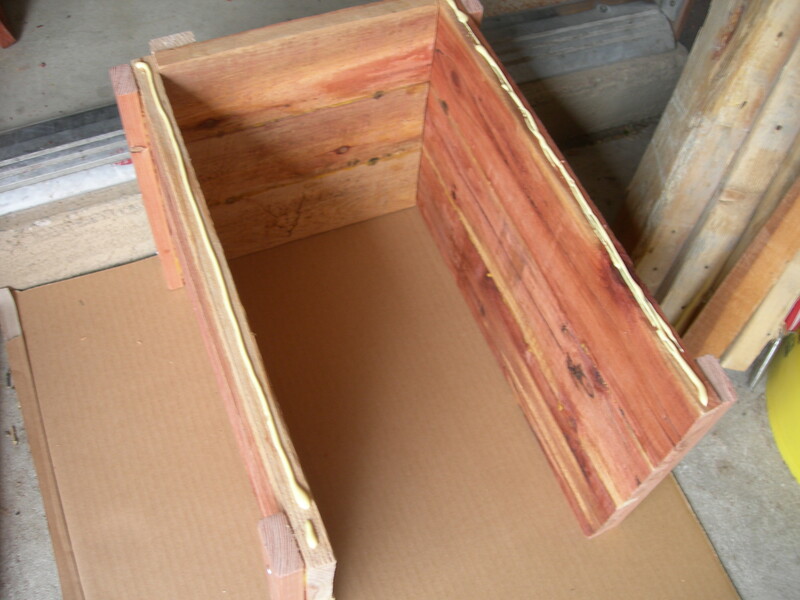 I used a saw in a miter box, which kept the saw straight up and down. Still, this was an unforgiving process, requiring two cuts to be made, and then breaking out the little wall between the cuts. It was hit or miss, but somehow I got it done. After the walls were made, it was time to attach them to the base. First I marked the base where the walls would go. 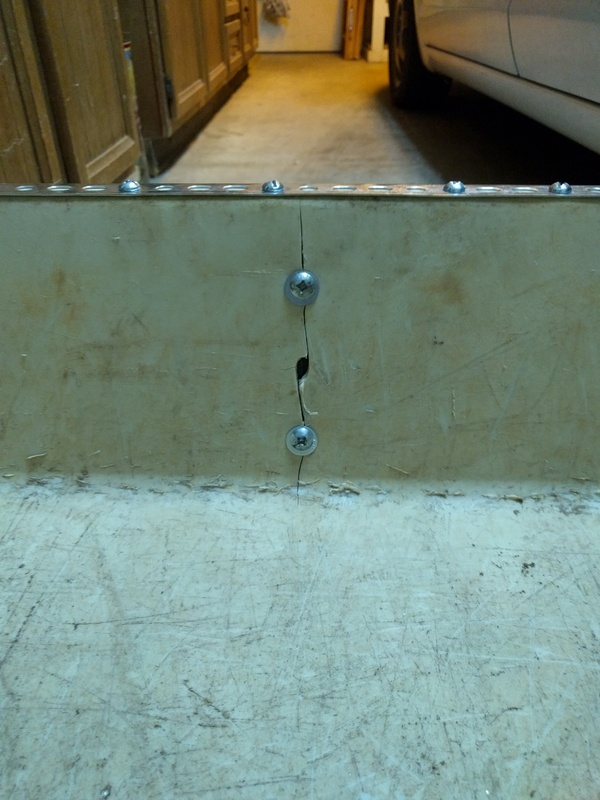 Since the 1-1/2 inch screws poked through the wood a little, I could press the screw points into the railings of the base to register where they would go for the next step of attaching the walls. I drilled the clearance holes from the top of the base to get them as centered in the rails as possible. I used 2-1/2 inch long, #8 screws, so the clearance holes were bigger than the ones for the #6 screws used elsewhere. I would have used #6 screws for the longer screws, but #8 was all I could find at the store. 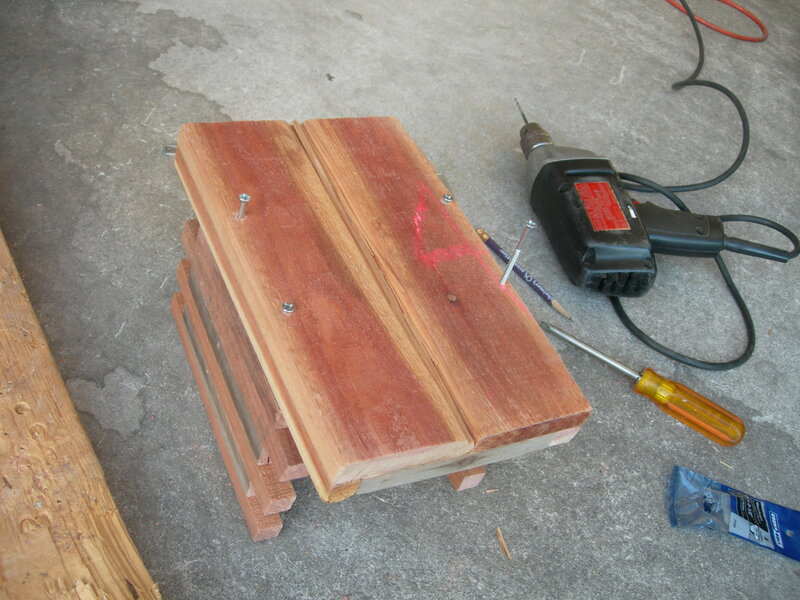 This was a tricky part, because the walls needed to be vertical when drilling the pilot holes for the 2-1/2 inch screws. The pencil marks and registration afforded by the screw points in the side rails of the base helped locate the walls. I did the best I could with getting the wall straight up and down. I decided to put braces between the walls for later, when the gables are attached. 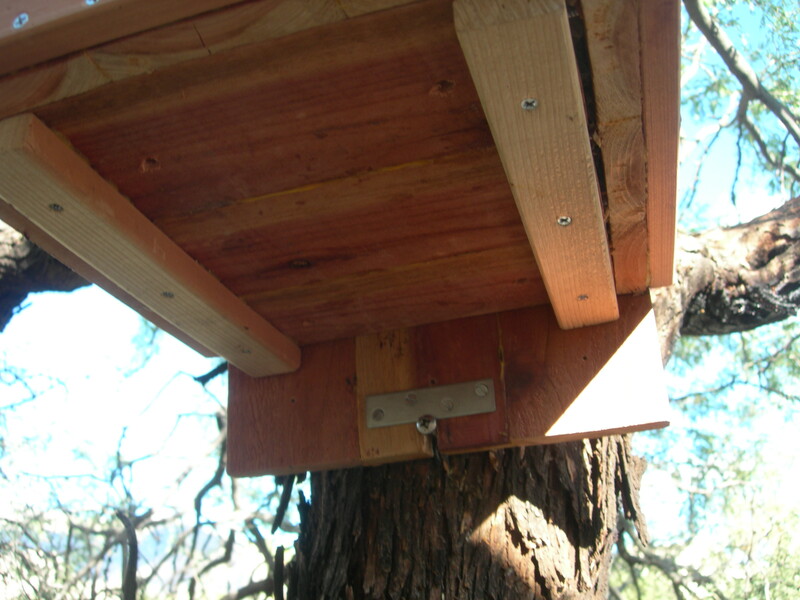 All the weight of the feeder transmits through the gables, so it is important that they are connected into the structure well. I bought a piece of Plexiglass at a local glass store, and I measured and cut it to fit. Plexiglass is similar to glass, but cutting it requires scoring a line on the surface over and over with some kind of blade and snapping it. I used a linoleum-knife type of tool to score the Plexiglass, and snapped it by holding one side down on a box with the scored line along the edge of the box, then quickly pushing down on the overhanging side. In some cases it didn’t break cleanly along the scored line, but I was able to snap off little pieces by grabbing them with a pair of pliers and breaking them off that way. With the Plexiglass cut, it was time to make the gable ends. 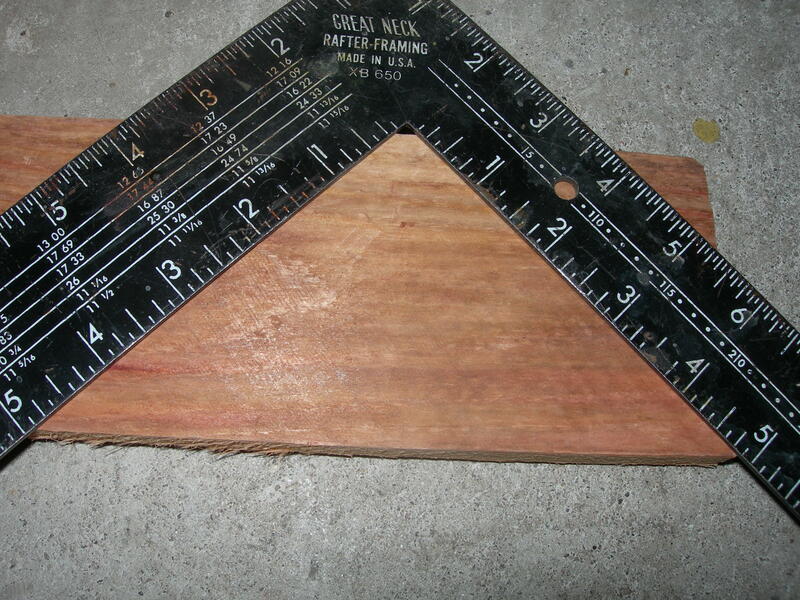 I had planned to use the miter box to cut the 45 degree angles this step would require, but the 3-1/2″ board was too big for the miter box’s clamps, so I used the rafter square to mark the 45’s by lining-up the bottom of the board with equal numbers on the two halves of the square, 4-7/8″ in the picture below. I marked the wood and cut the upper right hand corner off, then measured the distance for the base of the triangular gable, repeating the process above to make the second 45 degree angle cut. One more measuring and another 45 degree cut later, and I had the two gable ends. 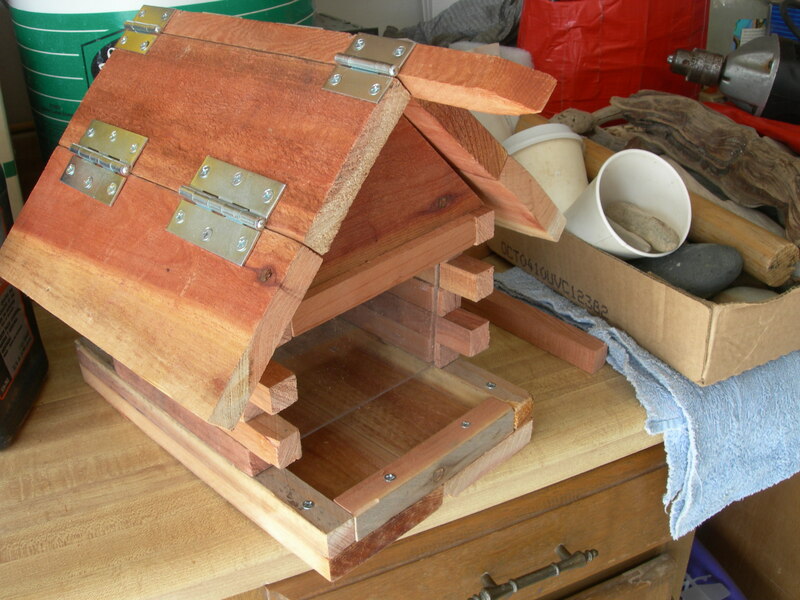 I thought the braces were too far away from the Plexiglass to prevent the birds from being able to climb behind the gable and into the space where the seed goes, so I decided to move the gables in a little. This required a fair amount of care when drilling, or else the pilot holes would miss the brace pieces. It also was not too easy to keep the gable from sliding when trying to drill through the clearance hole in the gable and into the brace. So I used the smallest drill bit to get a pilot hole started in the brace, then once it was drilled with a small drill, increased the bit size to 5/64″ for the #6 screw pilot hole. Even using 1-1/2 inch screws, the brace and gable were not connected that well together, so I decided to remove the gable and brace pieces and put in another screw, this one straight through the brace and into the gable to secure the two together better. 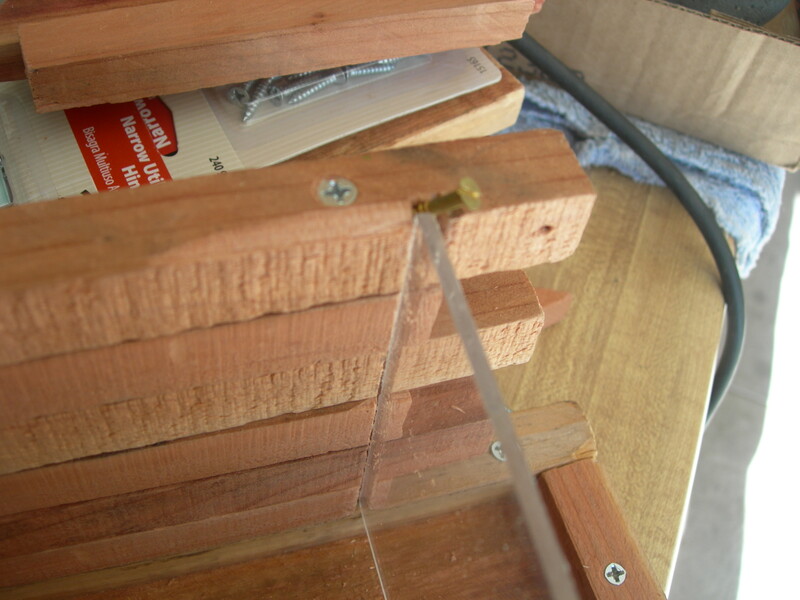 While I had the braces and gables off, I put in small brass screws to hold the Plexiglass into place. 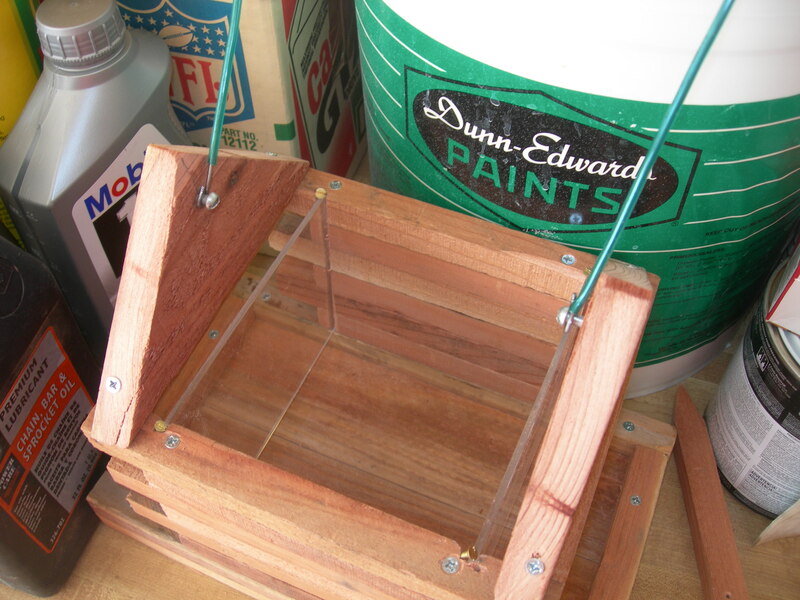 This will keep birds from going under the Plexiglass and getting trapped in where the seed goes. Here is a picture of a 1-1/2 inch screw going in to strengthen the connection between brace piece and gable end. Note the slotted screw near the apex of the gable. This is where one of the wires will attach to hold the bird feeder up. With the gables attached, it was time to make the roof. I had decided on nine inches for the length of the roof, but found three boards I had from before that were about 9-1/4 inches, and decided to make the roof 9-1/4″. One more cut and I had all the pieces I needed for the roof. I used big hinges to connect two board together to make one half of the roof. 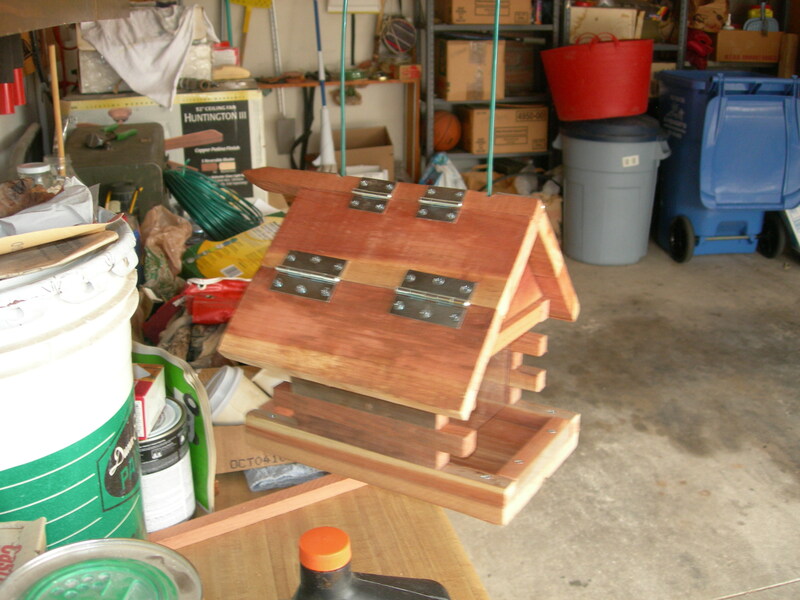 And I used smaller hinges to connect the roof pieces to the ridge beam – made from the end of a garden stake. I had to be careful about the placement of the smaller hinges in order to allow space for the wires that had to go through the ridge beam and tie to the slotted screws in the gables. 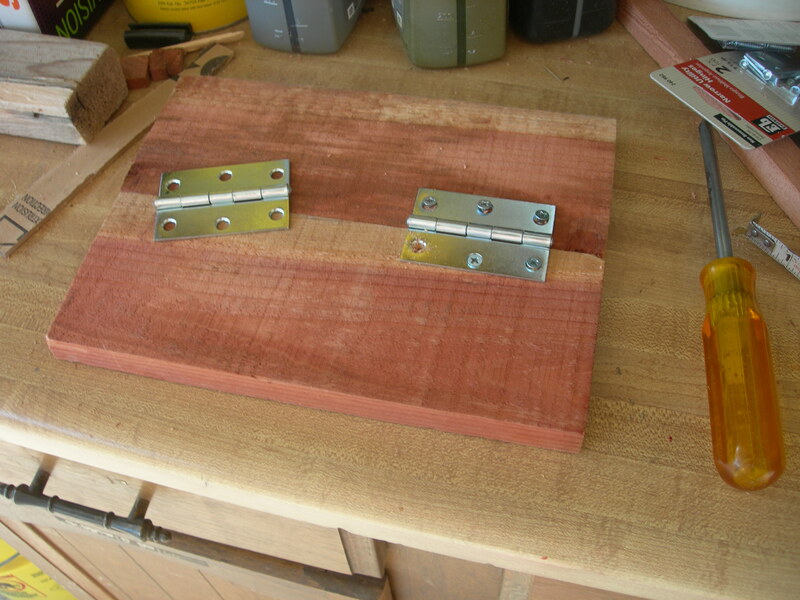 I filed little flat areas on the beam to make places for starting to drill the holes for the wires. I did this very gradually, first using the smallest drill bit, and working up to 1/4″ holes. I straightened two pieces of plastic coated wire about 13″ long, stripped back the coating, and attached them to the slotted screws. Then I was ready to thread the wires through the roof holes and attach them to a hanger I’d made. I made the hanger out of some really heavy steel wire I found in the garage and attached the green plastic coated wires to the hanger. 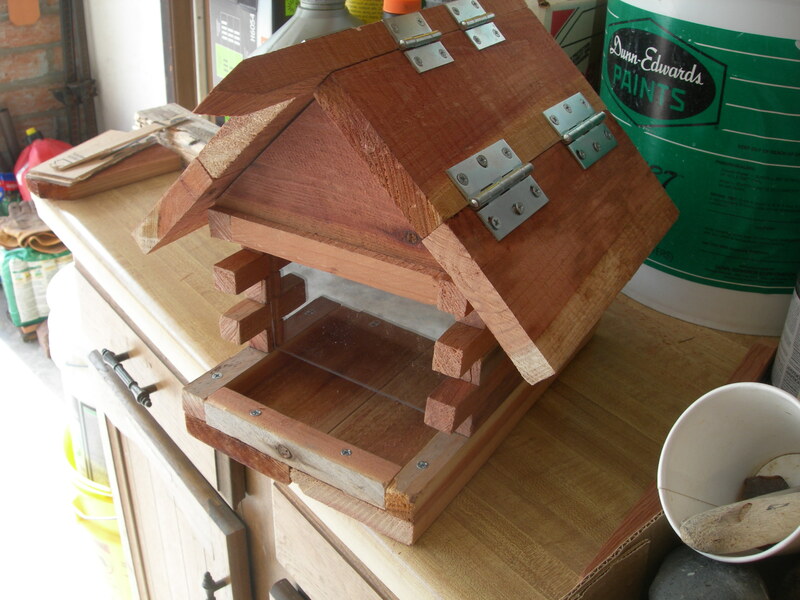 Here is the finished bird feeder suspended from a cabinet pull. And here is the reverse angle. Here is the feeder ready for use. I left the pointy end of the garden stake as part of the ridge beam. It’s a nice touch I think, and reminds me of something that might be done when building a barn, to have a place to attach a pulley for raising hay bales into the loft, or a block and tackle for pulling an engine out of an old pickup truck. 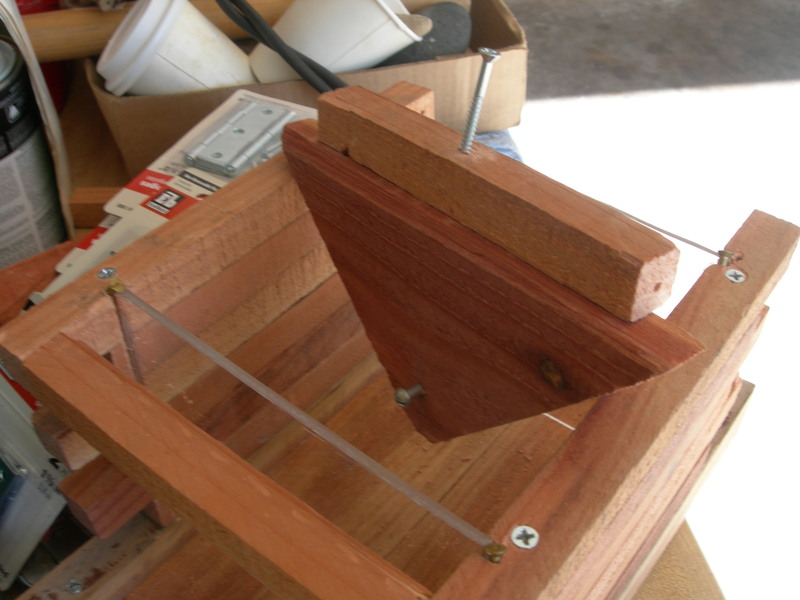 The smaller hinges function very well when putting seed into the feeder. With the old feeder, the whole roof had to be lifted up. The hinges make it a lot less cumbersome. 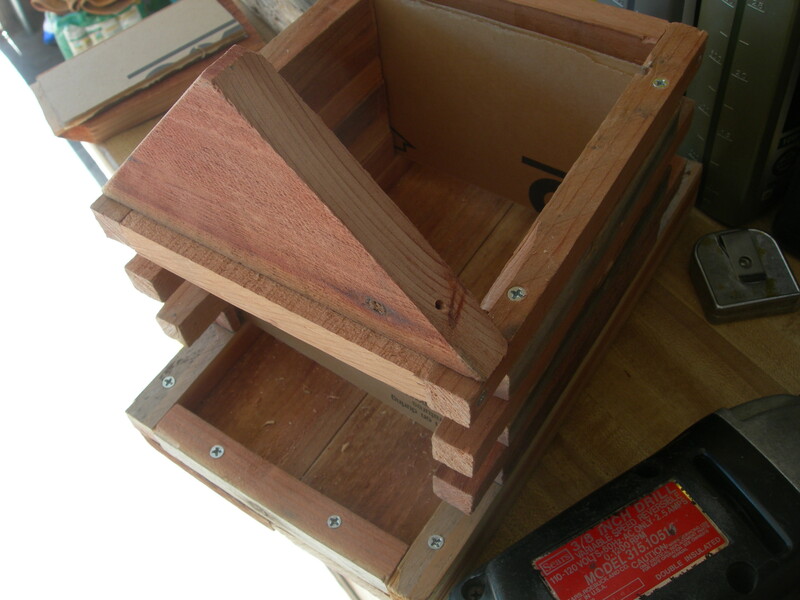 I had made a couple of nest boxes for western screech owls. The first of these produced two fledglings in its second year. Here is a picture of the two, shortly after leaving the nest. 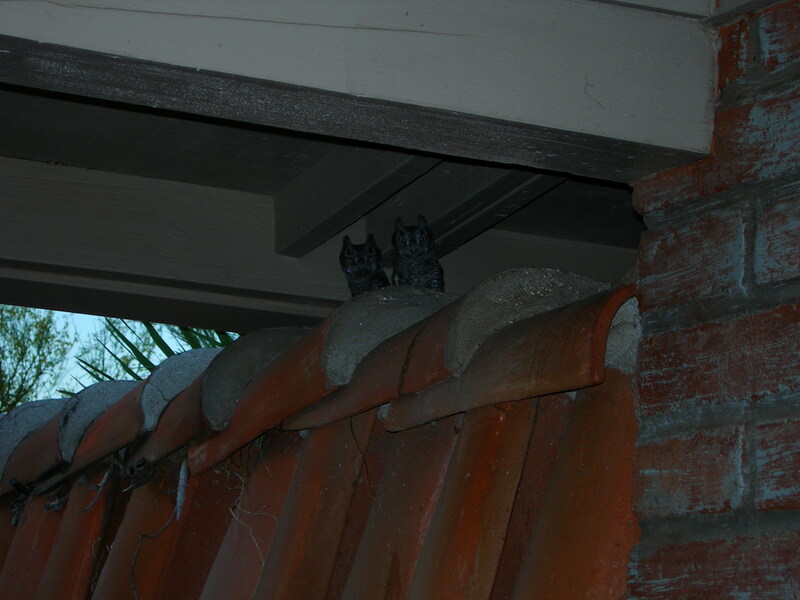 A full grown western screech owl is not much bigger than these juveniles. When cleaning out the first owl nest box around the end of October that year, the box fell apart, and a second owl box had to be made. 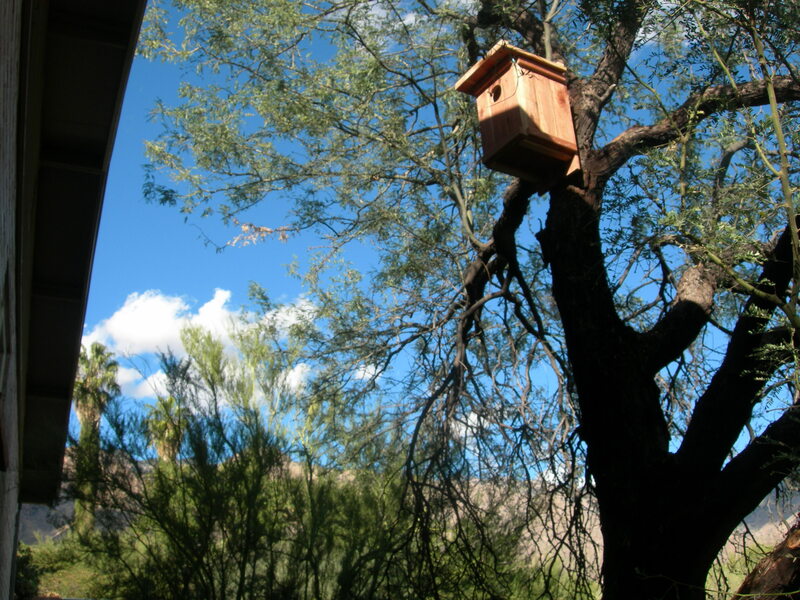 Here is a picture of that second box, in the same location as the first, about 12 feet above the ground in a large mesquite tree. This second owl box went up in November 2010, and had visitors over the winter and spring, but no takers in terms of nesting in spring 2011. 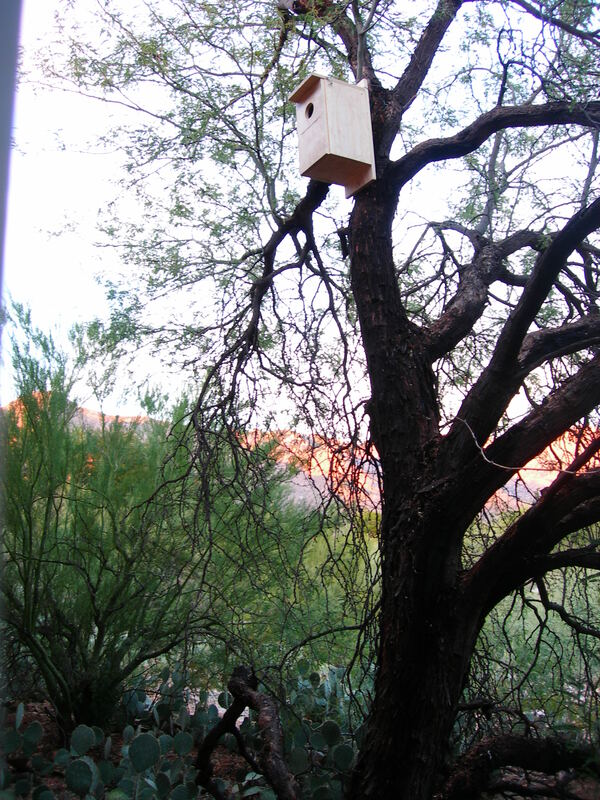 There was considerable interest in the box by spring 2012, and I was sure a male screech owl would attract a mate to it. That might have happened, had it not been for bees moving in – in April or May of 2012. As with the first, the second owl box was starting to crack that spring. The weight of bees and honey didn’t help, and it was in rough shape by the end of the summer. 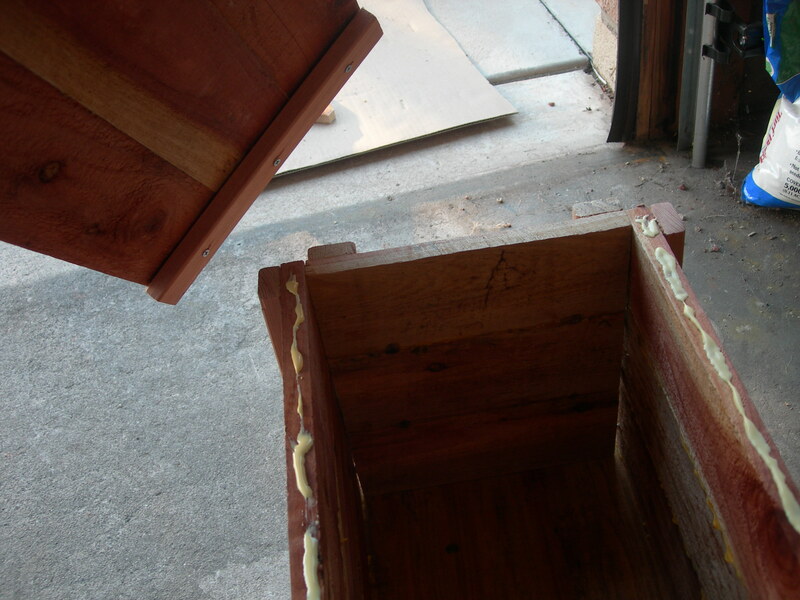 In October 2012 I had a live-bee-removal service come out and take the box and bees away one evening. The bee man came by in an old Ford pickup truck with the driver’s side door missing, and got the now bee box down. One side of the box was split almost wide open, honeycomb filling all the gaps; the 3″ opening in the front was solid propolis, some mysterious product bees make. The bee man used a smoker with weeds as the fuel, and put in ammonium nitrate fertilizer which decomposes to nitrous oxide to keep the bees from being too agitated. Except for one bee that got in his ear, he seemed to get them all. But the next day I saw a handful of bees buzzing around the area where the bee box had been. Oh well. 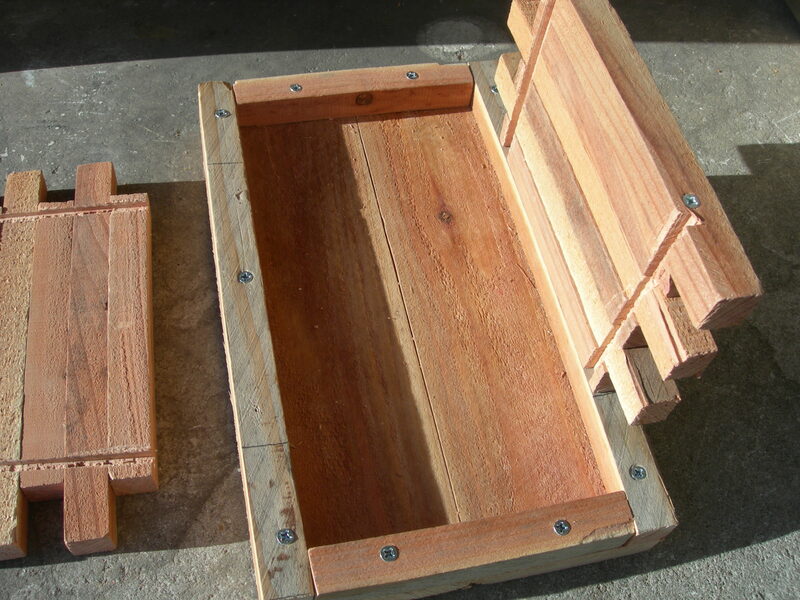 Time to make a new owl box! 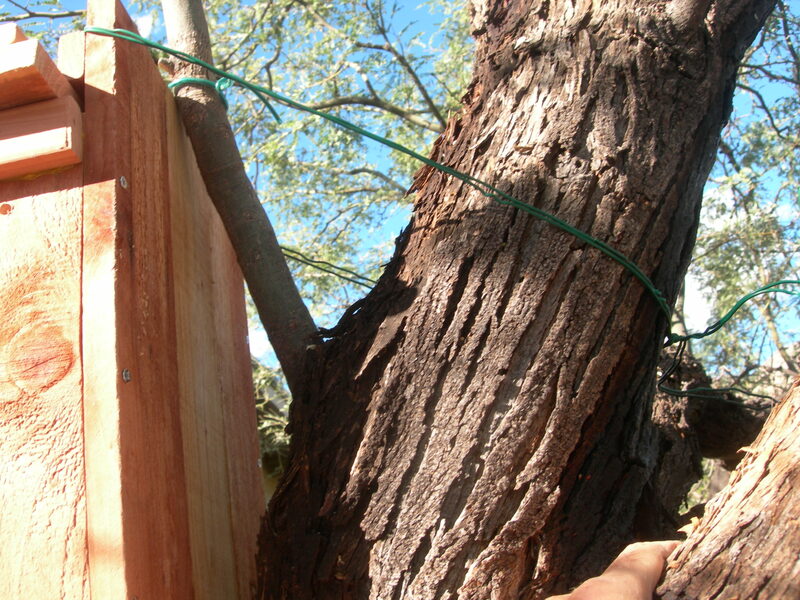 It was not easy to get the second bee box down, because the stainless steel screw in the mesquite tree was frozen in place. 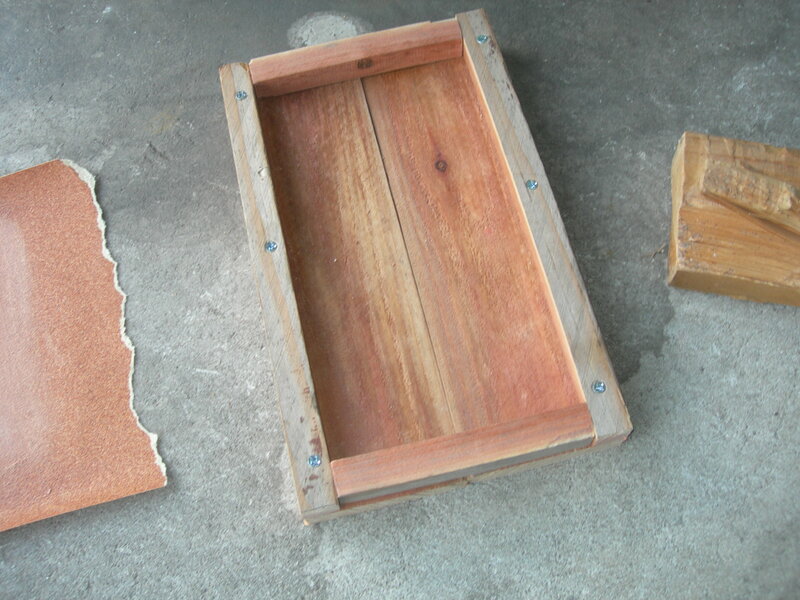 Because of this, I decided to make it so the new box could at least in theory be brought down without any tools. 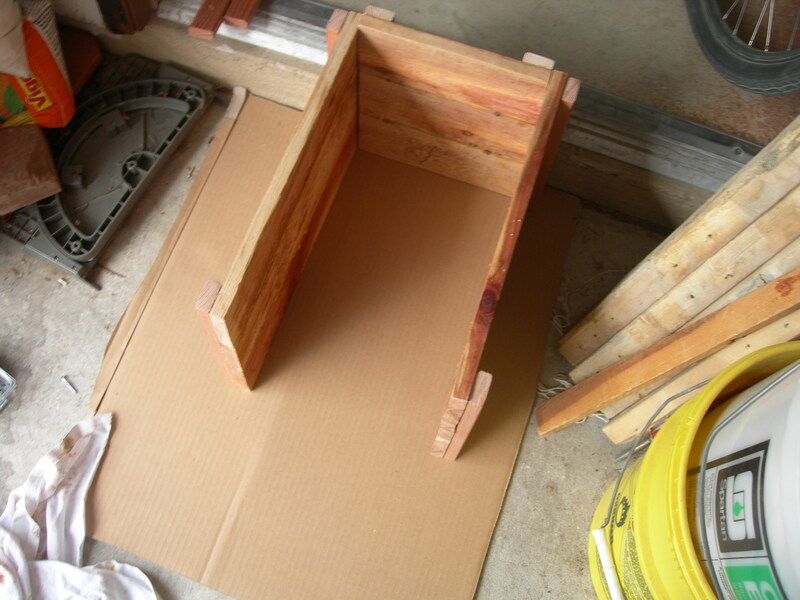 Also, I was motivated to make a box that would last longer than two years and to use relatively inexpensive wood. After cutting all of the pieces, it just took glue, screws, and drilling clearance and pilot holes, to make the individual boards. 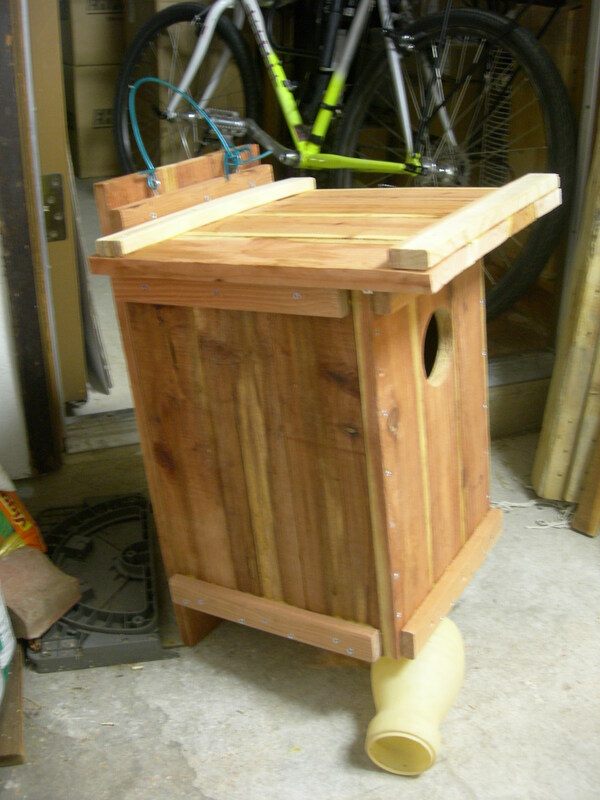 There are websites devoted to such things as screech owl nest boxes, and I used the same basic design I had before. The back board is 22″, the sides and front are 16″. 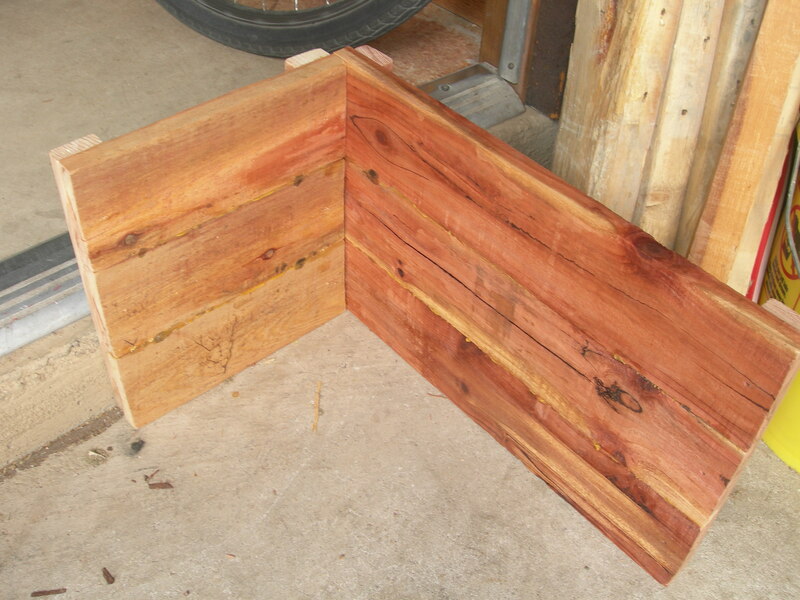 I glued three pieces of the fencing together, making the width of each of these boards 10.5″. 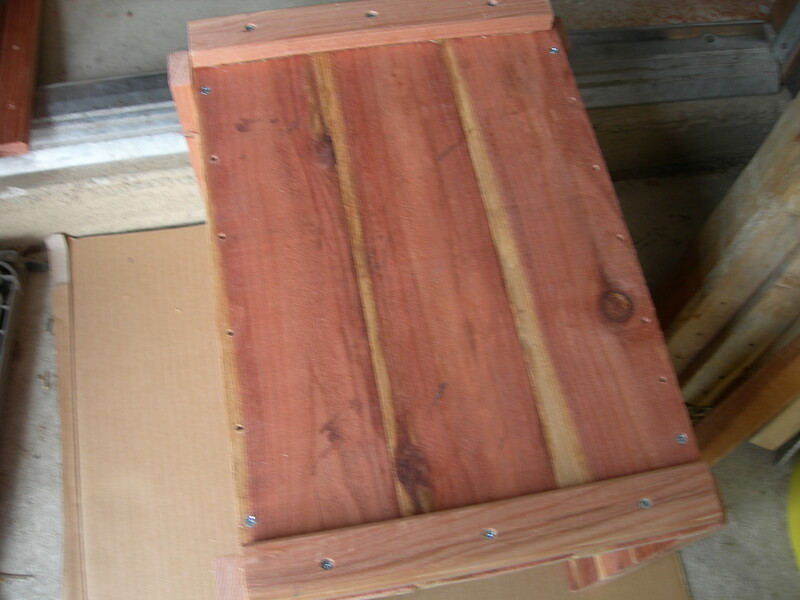 I used four boards for the top so there would be overhang. 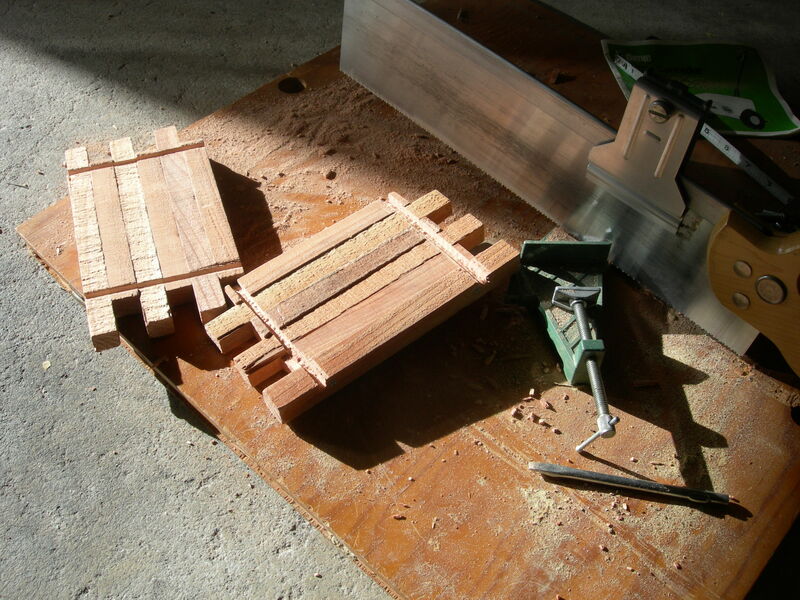 The bottom piece fits inside, between the sides, so has to be cut to fit. It is better if the bottom piece is a little short. 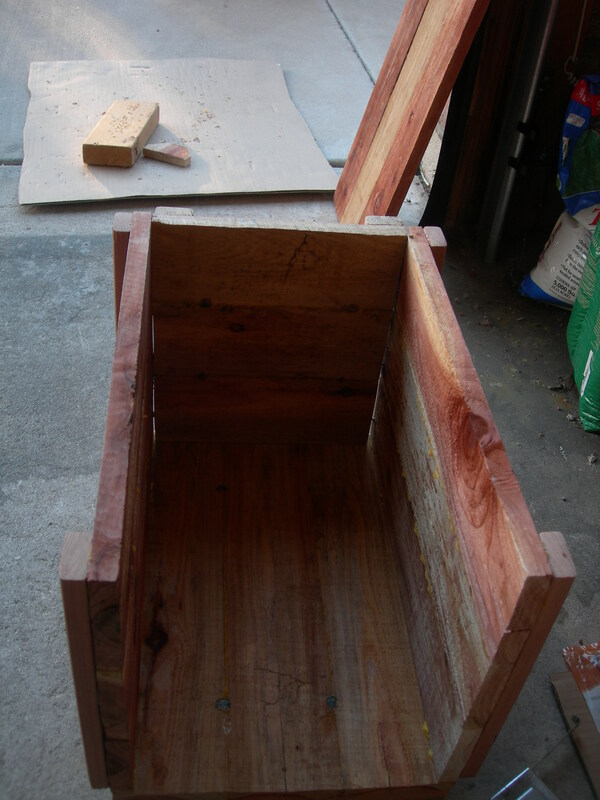 Gaps in the bottom will allow drainage should water find its way inside. Drainage holes are also drilled in the bottom for the same purpose. I quickly attached the front with four screws to locate and hold things together. This took a little doing. I predrilled the clearance holes in the front for the screws. Then I put on the glue and set the front on the sides and drilled one pilot hole in the location for one of the four screws. The pilot hole is small, 1/16″ for a #6 wood screw in soft wood. One at a time I put in the four screws shown below, realigning things before drilling each pilot hole. After this, I quickly drilled all the pilot holes and put in all the screws before the glue set up. After attaching the front to the sides, I attached the bottom. I had to use two-and-a-half inch screws because of the thickness of wood. I didn’t use glue. 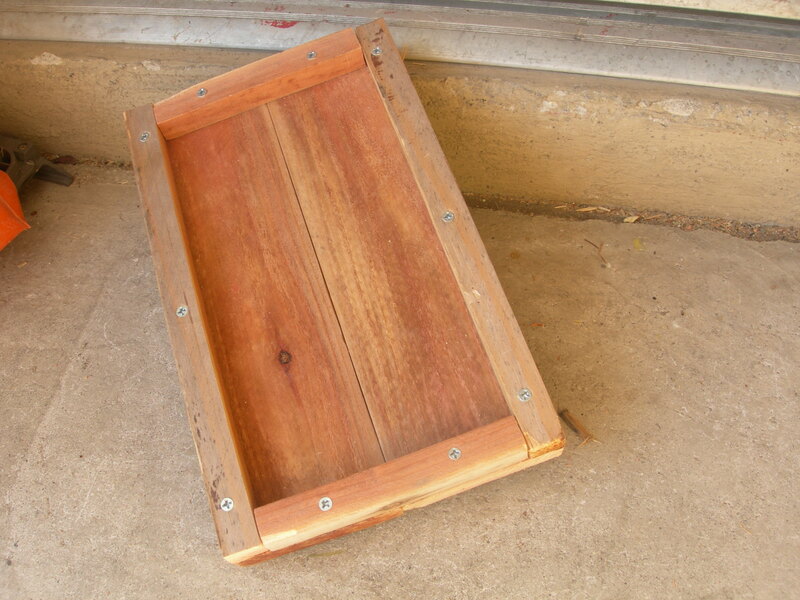 After attaching the bottom, it was time to attach the back, the 22″ board. I lined up the sides to the back board, and put a temporary cross piece to “remember” where the bottom was when things were lined up. After doing that, I flipped over the part that was already assembled. Then it was ready for glue and attaching the back. You can see the temporary piece that helped in lining up the back to front-side-bottom assembly. 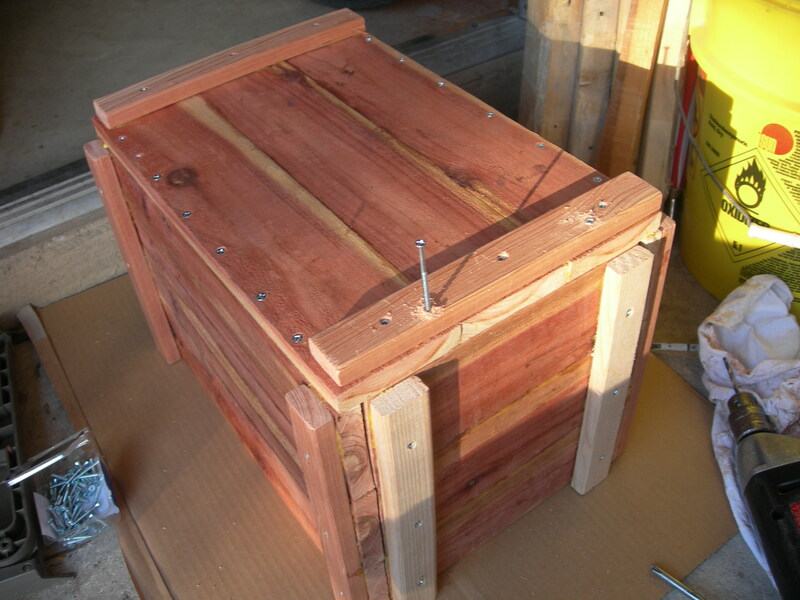 Here is the box, almost finished, with the top set in place. Rather than have hinges for the top, I made it so the top interlocks under a cross piece attached to the back. In the front I put screw eyes and used wire to hold the top down. I made a handle out of wire to help in carrying the box. I got wood shavings at the pet store. The owls like a few inches of shavings in the bottom of the box. I carried the box while climbing the tree, setting it different places on the way up so I could use two hands to climb. I had made a slot in the bottom of the back board to make it easy to slip over the stainless steel screw left from the earlier owl boxes. I put a bracket on the back board to reinforce the slot. At the top, I used wire to hold the box to a branch, and longer wire to pull the box to vertical. It is important that the box is not tilted. The owls want it to be vertical. 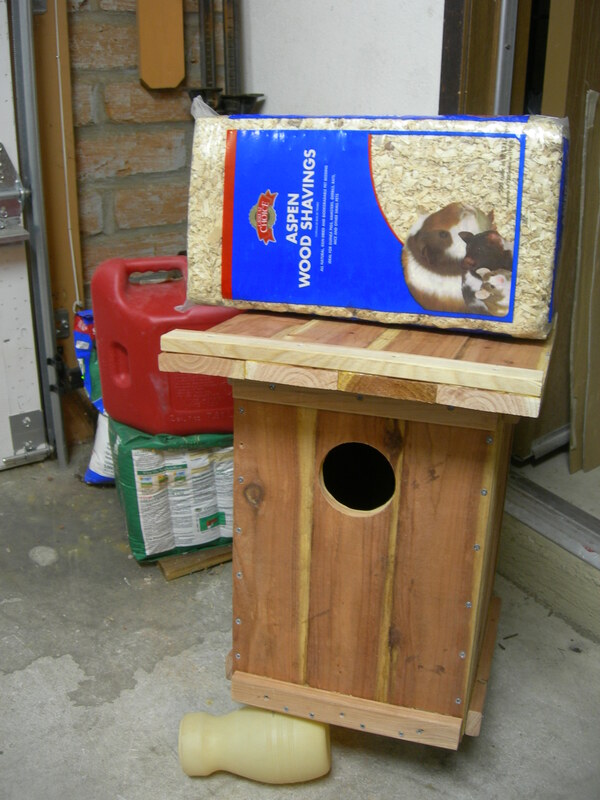 Here is the new box, ready for owls to find it.